"Sail on, O Ship of State..."
The Monarca was a ship-of-the-line (forerunners of modern battleships, a term that, indeed, comes from the older phrase, "ship of the line-of-battle") of the Royal Navy of the Kingdom of the Two Sicilies (alias the Kingdom of Naples), later acquired by the navy of the Kingdom of Italy. How she went from one to the other is part of the history of modern Italy. The vessel was designed in 1846 by Felice Sabatelli and launched in June 1850 in the shipyards of Castellammare di Stabia near Naples in the presence of Ferdinand II of the Two Sicilies (thus, the name of the vessel - 'Monarch') and his queen consort, Maria Teresa. The ship was originally designed with three decks and sail-only propulsion (three masts and square-rigged sails). It entered into service in November 1852. It was a typical powerful ship of the times: wooden hull coated in copper below the waterline, well armed with 84 guns on the three decks and with a crew of 15 officers and 688 petty officers, marines and sailors, the Monarca was upon its entry into service the largest warship in Italy: it lacked, however, steam propulsion and was quickly out of date. To solve that problem, some six years after entry into service, at the end of 1858, the Monarca returned to the yards of Castellammare, where she was converted to a steam-driven screw-propulsion vessel, maintaining, however, her now auxiliary sails. The armament was reduced to 64 guns. This was all during the spring and summer of 1860, however, during Garibaldi's Expedition of the Thousand, that is, the invasion of Sicily that led to the collapse of the monarchy of the Kingdom of the Two Sicilies and to the unification of Italy. The Monarca had been undergoing her conversion while Garibaldi had sailed down the coast, landing in Sicily on May 11. In spite of the impression that Garibaldi's expedition and campaign from Sicily to Naples was land-based— i.e. Garibaldi lands, he crosses to the mainland, he marches on Naples— activities at sea were very important. Garibaldi landed in Sicily on May 11, 1860, and didn't cross to the mainland until August 19. It took him three months to secure Sicily. Much of that was concerned with how to deal with the sizable fleet of the Kingdom of the Two Sicilies. Early on, Garibaldi had planned to try to capture rather than destroy Bourbon ships; it was the largest fleet in the Mediterranean and would make a fine part of a new all-Italian navy. For that entire summer of 1860, Sicily, under Garibaldi, was called the Sicilian Dictatorship and they quickly decided to send elements of the “Dictatorial Sicilian Navy” up to the yards at Castellammare where the new Bourbon flagship, Monarca, was moored, not yet quite ready to set sail again, and capture her. They used an ex-Bourbon frigate, the Veloce, renamed Tukery, with 150 crew plus squads of boarders and sharpshooters. The Tukery was, however, much smaller than the Monarch with inferior weaponry. It would be no contest on the open seas. It would have to be a surprise raid: board and capture in port. Towards midnight on 13 August (only one week before Garibaldi crossed to the mainland for the drive to Naples), the Tukery entered the port of Castellammare and found an unexpected situation: despite advance reports from "insiders" the Monarca was no longer moored along the quay (which would have facilitated the approach and boarding), but was moored with the bow facing the sea, which made a boarding very difficult. Also the port was on alert, having had a false alarm a few days earlier. In September,with Garibaldi closing in on Naples; the royal family fled with loyal elements of the army to Gaeta, where they put up a futile resistance at what has become known as the Siege of Gaeta. Almost none of the Bourbon navy had fled with them; they stayed in port in Naples, accepted their fate and became part of the navy of the Kingdom of Piedmont and Sardinia (which is what the north was called before officially proclaiming the Kingdom of Italy in early 1861.) 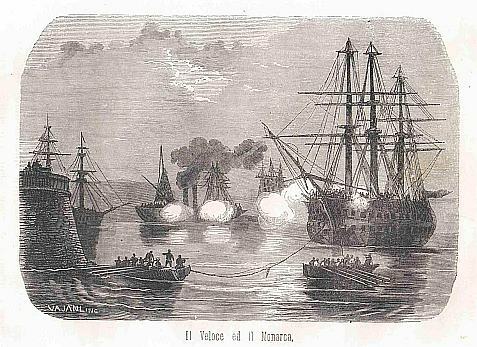 The Monarca was rechristened the Re Galantuomo (The Gentleman King) and entered service in November of 1860, while the siege of Gaeta was still going to oust the last remaining Bourbon forces. The statue of the last Bourbon king, Ferdinand II, that had adorned the prow, was removed and replaced by one of (guess who) Victor Emanuel II (the Gentleman King!) and that was that. The ex-Monarch now set off after her former monarch, himself now a real ex-monarch, who had fled to Gaeta; the ship helped set up a blockade and siege. She even fired on the fortress where the ex-king and queen were holed up. The new Royal Italian navy was founded on March 17, 1861. The Re Galantuomo entered service as the largest ship in the fleet. She was re-outfitted to cruise at around 8-9 knots and in the 1860s undertook a number of cruises in the Mediterranean. She sailed to America in 1863 to bring material to a new Italian ship being built in New York. Her weaponry was upgraded once again and she entered patrol service in the Ionian and Adriatic during Italy so-called “Third War of Independence” (against the forces of Austria-Hungary in 1866). She was taken out of service in 1875 and subsequently dismantled. The figurehead from the prow is preserved in the Naval Technical Museum in La Spezia. You can still see the ship, though —in a way. The “tall ship,” the Amerigo Vespucci, the training vessel used in the Italian navy (and her sister ship—no longer in existence—the Cristoforo Colombo) though both built in the 1930s were modeled after the original old Bourbon flagship, the Monarca. I wonder what Felice Sabatelli would make of that!